BEIJING -- World Bank President Robert Zoellick said he is talking to Chinese government officials about cooperating on investments in Africa, which he said could help boost the continent's economic growth. 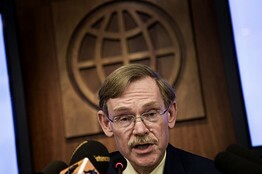 Mr. Zoellick told reporters Wednesday during a visit to the Chinese capital that China Investment Corp., the nation's sovereign-wealth fund, has expressed interest in investing in the World Bank's recently launched asset management company, which invests private-sector funds into places like sub-Saharan Africa and Latin America. "CIC expressed interest in this as a commercial investment vehicle, but obviously there is no decision yet on their part," Mr. Zoellick said. Other sovereign-wealth funds and pension funds are also interested in the new investment vehicle, he said, which manages some $4 billion in funds.